Kimmel, Vandermeersch Conclude Illinois State Fair With Race Wins! Springfield, Il August 17, 2008-Frank Kimmel probably could us a trip to Las Vegas as seven is clearly his lucky number after the 46 year old veteran from Clarksville, Indiana smashed all the stock car auto racing records books Sunday at the Illinois State Fairgrounds with a record setting seventh victory in the 46th Best Western-Allen Crowe 100 ARCA RE/MAX Series event. Kimmel has now won seven of the last nine Allen Crowe 100 races held on the Springfield Mile. Kimmel started a beautiful Sunday afternoon in the Illinois capitol by setting a new track (and world) record for the one mile dirt track in qualifications with a 32.878 circuit (109.496 MPH) smashing the one year old qualifying mark of Damon Lusk. In fact several drivers eclipsed the Lusk mark during the qualifying session. Tennessee veteran Ron Cox got the jump on Kimmel at the start and led the first 12 laps with Wisconsin's Dexter Bean leading three more before Kimmel took the lead on the 16th lap. Kimmel relinquished the lead to Missouri's Doug Keller during a round of pit stops on lap 27, but quickly regained the top slot on lap 31 and he was never seriously challenged after that, though A.J. Fike of Galesburg, Illinois ran a close second for a number of laps before his car blew an engine on lap 78. Mississippi sensation Ricky Stenhouse, one of three drivers doing double duty at Springfield in USAC and ARCA machines, came home second in the Roush Fenway Ford, with Michigan's Brian Tyler third in a Toyota. Tyler, who won the USAC Tony Bettenhausen 100 the day before, was attempting to become just the second driver in the 98 year history of auto racing to win both the championship dirt car and stock car event on the same weekend, a distinction belonging only to Al Unser who won both in 1972. The race was slowed by six cautions and there were several accidents but no drivers were injured. Several Illinois drivers made the 46th Allen Crowe 100, in addition to the aforementioned Fike, Springfield's Justin Allgaier finished 6th after experiencing mechanical issues, fellow Springfield driver Kelly Kovski was 9th, Arenzville's Mark Littleton 19th, Alahambra's Dale Shearer 28th, Manteno veteran Bob Strait 31st and Kyle Chady of Benton 33rd. In addition to the record 7th Crowe 100 win, Kimmel tied the legendary Dean Roper for most stock car wins on the Springfield Mile, 7. Kimmel increased his leading laps led at Springfield with 570 and becomes the driver with the most consecutive ARCA starts at Springfield with 17. Kimmel also became the 14th driver to win a stock car race from the pole at the Illinois State Fairgrounds. The ARCA RE/MAX Series returns for it's second and final dirt race of the season on Labor Day at the DuQuoin State Fair. 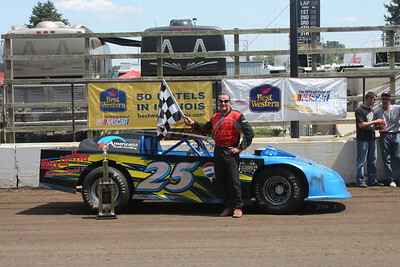 In the companion running of the 15th Sportsman Nationals, Springfield's Dennis Vandermeersch held off repeated challenges from five time winner Wed O'Dell to post an emotional third victory, ten years after his second Sportsman triumph. Vandermeersch started on the pole and led everyone of the 20 laps taking 27 minutes to completed the distance in a race slowed by five cautions.